Grizzly bear cubs photo, Katmai National Park, Alaska. 4 grizzly bear (brown bears, Ursus arctos) in the forest of Katmai National Park and Preserve, Alaska. Please click on the image to view a larger version of the photo. Welcome back to the land of the Great Bear! This year’s grizzly bear photo tours were absolutely awesome. We had cubs, cubs and more cubs. Big bears, little bears, fat bears, pretty fat bears, REALLY fat bears, and Rush Limbaugh-fat bears. ; we’re talking, R-E-A-L-L-YYY fat bears. 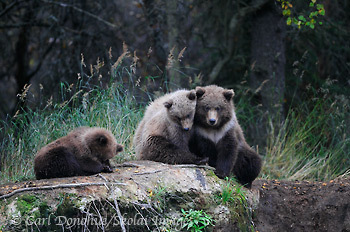 Dark bears, blond bears, etc, etc – all of them a real treat to photograph. There were well over 70 bears in the area, so it was a simply incredible experience. I’ve not yet edited hardly any of the shots from the past 2 weeks, but I’m pretty excited about some of the photos I took. Disappointed, of course, in some of the ones I know didn’t come to fruition or didn’t come out well, but overall, I think it was a good trip. The folks who came along all had a lot of positive commentary about the trip, which was great, too. We were blessed on both weeks with some great weather, as well as some dingier days. We made the most of the nice light when it happened, and enjoyed the almost completely rain-free time. The larger cub in this photo was one of my “favorite” bears on this trip. Talk about cute. That collar is about as classic as they come, perfectly symmetrical, and he wore it with pride. What a cute little fella (well, “I shouldn’t say “little, he’s easily the largest and hungriest of his litter)! Anyway, it’s off to bed for me, but I’ll try to get around to posting some more images from this trip in the next few weeks. I also have to catch up on editing the images from the rest of the summer. What a blast this summer was! This entry was posted in Alaska, Grizzly Bears, Katmai National Park, Wildlife and tagged grizzly bear cubs, Wildlife on October 4, 2010 by Carl D.
Rush Limbaugh fat???!!! That must have been one fat, attention addicted, trouble making bear! Too funny. Can’t wait to see the rest of the photos! I am offended that you would insult a Grizzly Bear by comparing it to the lowest and least intelligent form of life on the planet, LOL. Sounds like a great experience and nice photo here too.